Web search engines have become an essential tool to find online resources. However, their use can reveal very detailed information about the interests of their users. In this chapter, we detail co-utile protocols for exchanging queries between users in an anonymous way. Specifically, by exchanging queries with other users, the query profile associated to each user is masked and approximates the average group interests. However, the query exchange protocol has a cost. To thwart free-riders (who take advantage of the protocol to mask their profile but are reluctant to help others) we employ a co-utile reputation management system. 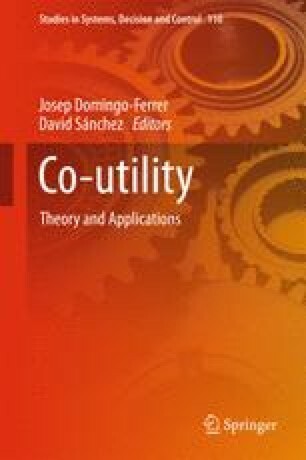 The theoretical analysis is complemented with empirical results obtained from an implementation in a simulated multi-agent environment, which illustrates how co-utility can make cooperation self-enforcing and improve the agents’ welfare. Funding by the Templeton World Charity Foundation (grant TWCF0095/AB60 “CO-UTILITY”) is gratefully acknowledged. Also, partial support to this work has been received from the Government of Catalonia (ICREA Acadèmia Prize to J. Domingo-Ferrer and grant 2014 SGR 537), the Spanish Government (projects TIN2014-57364-C2-1-R “SmartGlacis”, TIN2015-70054-REDC and TIN2016-80250-R “Sec-MCloud”) and the European Commission (projects H2020-644024 “CLARUS” and H2020-700540 “CANVAS”). The authors are with the UNESCO Chair in Data Privacy, but the views in this work are the authors’ own and are not necessarily shared by UNESCO or any of the funding bodies.